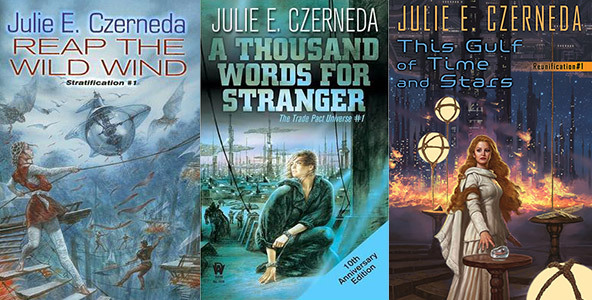 Today I’m delighted to welcome Julie Czerneda as part of the Futures Past Tour celebrating the release of her upcoming science fiction novel! 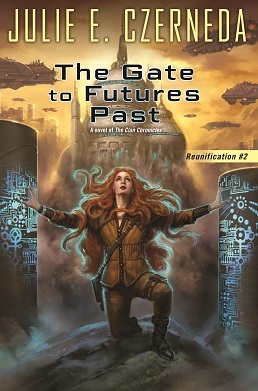 The Gate to Futures Past, the second book in the Reunification trilogy after This Gulf of Time and Stars, will be released on September 6, and I have a guest post by the author and a book giveaway of both Reunification books—plus DAW Books is offering a tour-wide giveaway of all eight Clan Chronicles books! Move in the Midst? Oh, why not?! Let me count the ways, shall I? First, to set the scene. We’d lived in the same spot for a staggering (for us) 24 years. Time to go, we decided. Late spring, 2015, we put our house on the market for a month—a trial run, so to speak—then took it off again. No takers and, after all, I’d a book to finish. This Gulf of Time and Stars, as it happened. Having garnered all manner of useful information, my darling Roger applied himself to making our home more saleable, whilst I focussed on writing. That’s how we roll, you see. Fast forward, oh, say five months. Now almost spring, 2016, with Gulf long done and released. I’m in the final, rather agonizing third of its sequel, The Gate to Futures Past. Roger sidles into my office. He does that when I’m writing, so as not to disturb my train of thought, but this time there’s a certain “Indiana Jones dares enter scary temple” quality to that sidle. I pause. “We were too late, last year,” he begins. I give a cautious nod. “Spring’s just around the corner.” So help me, he’s grinning. I glance hopefully at the screen, but the page number is still the same as a moment ago. As yesterday, for that matter. Tough spot, this midst of story. Spring is the time, but… “I can’t stop to help,” I admit. 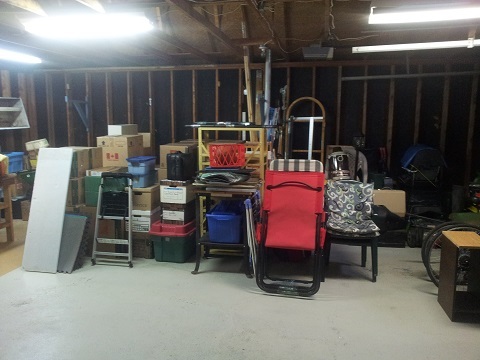 There’s decluttering, cleaning, all that post-winter stuff. 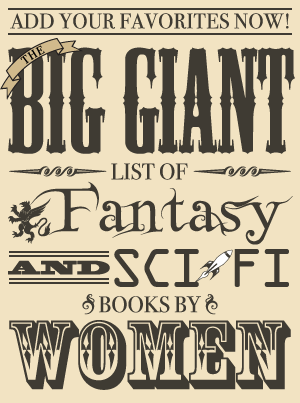 We’ve lists. Long ones. On the advice of our son, I took all the books from their shelves and put back only those I loved to reread. I did, in fact, keep writing. I did pack and sort books—and help paint—but Roger did indeed do everything else. 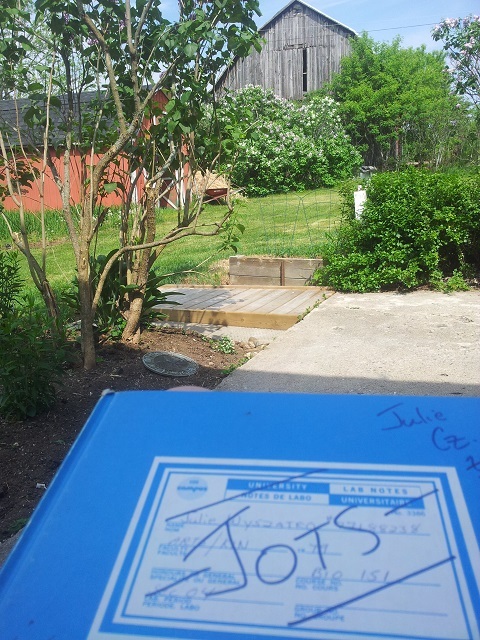 I send the first draft to my editor-dear, Sheila E. Gilbert of DAW (Hugo winner!!! ), added vacuuming to my daily routine, and we signed the paperwork to list the house slightly before the end of March, said the listing to go live in a week. Remember that. Because before the listing went anywhere? A couple came to our house, fell in love, and bought it on the spot. Which would have been wonderful, but their only condition? That we be out by the end of the month. I’ll set the stage again. I decided to resist. “Excuse us,” I tell the agent, and virtually drag my beloved into the other room. This from a man who’s lived with an author for almost 40 years. A major enticement, to be sure, but move out in the midst of revising said important, emotionally charged story? I’m not quite hyperventilating. “I can’t help till the book’s done,” I warn him. Again. That’s what he thinks. “Not my office. It stays normal.” As normal as can be. Roger grins and that, as they say, is that. Resistance was always to be futile. “We’ve sold the house! We’re moving!” A period of vast joy and dancing ensues, because this is what we wanted. Followed by a brief, weighty pause because yes, we’d forgotten something. “Where are we moving to?” he asks, very slowly. “You pack,” I offered. “I’ll find a place.” And did. Lest this make me seem amazing, I spent a whole 15 minutes on kijiji, located available rental properties in the area of our interest based on two key criteria—was there room for the books and did it have appliances?—and picked three to check out. Next day, we drive five hours, see the top two, pick one, and rent it. Day after that? Drive home. Day after? Surprise! (Not really, but it adds dramatic tension, right?) Page proofs for This Gulf of Time and Stars arrive, aka the mass market. From then on, I’m revising to the nurrrip! of the tape gun in the next room. True to his word, Roger did do everything he could without touching my office. I’d finish a section and discover the dining room dismantled. Another, and our bedroom closet had emptied. The basement filled with odd-shaped bundles wrapped in cellophane, Roger having discovered packing film and gone mad. His brothers came to help at one point. At least I remembered company at meals. Understandably, there were things my beloved couldn’t pack or wrap, mostly in hopes I’d decide I no longer loved ALL the books. The rental place wasn’t that big, you see. As those final three weeks flew by, I do believe the poor man was beginning to have nightmares about the untimely packing of books. Me? Mine were of being mistakenly wrapped in cellophane—when I wasn’t swimming in edit notes. Four days before the movers were to load our belongings in their truck, I ran spellcheck and hit send. Gate was done. Ish. Roger and I shared a celebratory bottle of wine, grabbed a quick supper, then? I took tape gun in hand and headed back to my office. 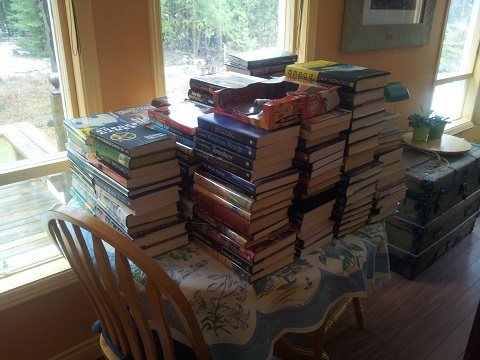 After doing the math, Roger suggested I no longer stack books in the middle of rooms. Having bid a fond farewell to twenty-one boxes of books I no longer required in my life, I packed the rest—five rooms of shelves—in four days. 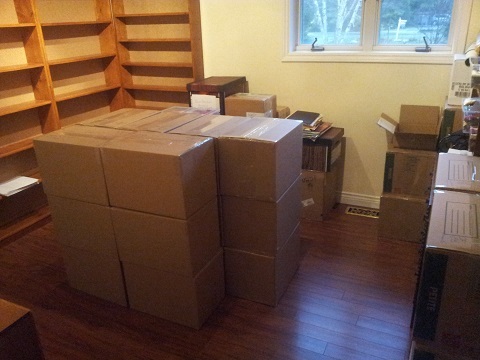 The six boxes of my own first editions and current manuscripts I labelled “A—Most Important—Julie’s Office” for the movers. * Our fabulous friend next door packed our kitchen. Thanks, Kate! As for my office? I packed my suitcase with what clothes were left to me and everything I’d need to proofread Gate. Oh yes, that was going to happen in the midst of moving INTO the new place. Our move couldn’t have gone better. Not surprisingly, our movers hadn’t encountered a Roger Prepped Home™ before. There were murmurs of stunned appreciation. They did their best to infuse some random elements by piling anything they weren’t sure of into the dining room. By the morning the movers arrived, Roger had sorted our stuff into different rooms and the garage based on fragility, type of material, and size. And that was that. We’d moved in the midst. The main thing, however, is that we’re happy. While I write, in the midst of boxes, Roger’s searching for that new home to fit all the books. It’s how we roll, you see. Together. It took a while to unpack my office, but I was hardly suffering. Nice view, isn’t it? And there are swallows. *One of my special boxes did get to my new office. The other five? Found at last, a month later, at the bottom of three very tall stacks of boxes labelled “C-Store in Driveshed.” Only slightly crushed. We had to laugh. Throughout the entire blog tour, there’s a chance to win all eight books in the Clan Chronicles (The Stratification Trilogy, The Trade Pact Trilogy, and the first two books in the Reunification trilogy). Below that giveaway is information on entering to win the two latest books! Both giveaways are US/Canada only. 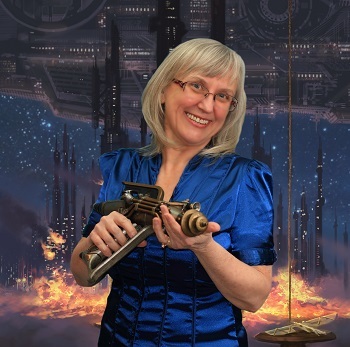 Courtesy of DAW Books, I have two sets of the first two Reunification books to give away! 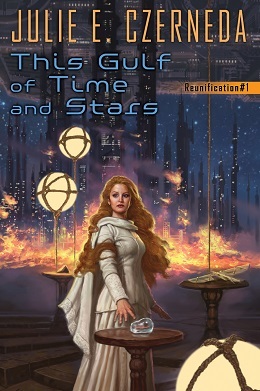 Each set includes This Gulf of Time and Stars in mass market paperback and The Gate to Futures Past in hardcover. Reunification Giveaway Rules: To be entered in the giveaway, fill out the form below OR send an email to kristen AT fantasybookcafe DOT com with the subject “Reunification Giveaway.” One entry per household and two winners will be randomly selected. Those from the United States or Canada are eligible to win this giveaway. The giveaway will be open until the end of the day on Monday, September 5. Each winner has 24 hours to respond once contacted via email, and if I don’t hear from them by then a new winner will be chosen (who will also have 24 hours to respond until someone gets back to me with a place to send the book). Please note email addresses will only be used for the purpose of contacting the winners. After the giveaway is over all the emails will be deleted. Update: The form has been removed now that the giveaway is over.